FAMOUS MATHEMATICIAN - Omar Khayyam was a Persian mathematician, astronomer, and poet. He was born in Nishapur, in northeastern Iran, and spent most of his life near the court of the Karakhanid and Seljuq rulers in the period which witnessed the First Crusade. 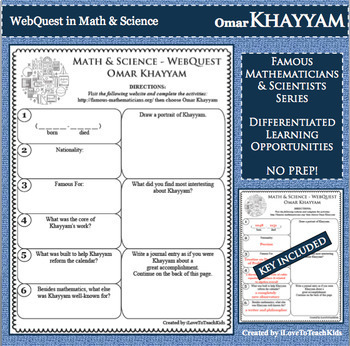 Engage your learners in fun, interactive, and creative ways to discover more about OMAR KHAYYAM using this WebQuest. Activity is differentiated allowing students to respond to open-ended questions reaching individual levels. INSPIRE your students!